If you want to customize your desktop background, you can use this wallpaper. A badass wallpaper for PS4 background. 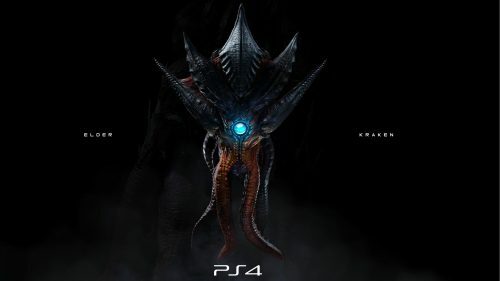 It’s featured with high resolution picture of Elder Kraken from Evolve game character. Evolve is a first-person shooter video game developed by Turtle Rock Studios. the game was delayed and released worldwide for Microsoft Windows, PlayStation 4, and Xbox One in February 2015. In Evolve, there are two types of characters: the monsters and the hunters. Kraken is the second playable Monster in Evolve. This is the only known creature that once it reaches stage 4 it has the capability of splitting its body into 4 separate hosts. Kraken’s head has four eyes and a sideways mouth formed partially of the tentacles running up and down its face. The bottom two eyes are slightly larger than the top two.